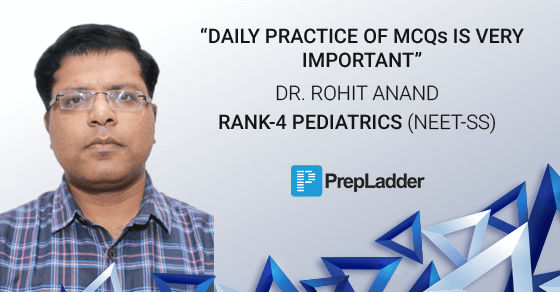 PrepLadder congratulates Dr. Rohit Anand on securing Rank 4 in Pediatrics Super-Specialty. We wish him all the best in his career and future ahead. Hi. I am Dr. Rohit Anand. I did graduation from Sardar Patel Medical College Bikaner, DCH from Ravindra Nath Tagore Medical College Udaipur & DNB from Chacha Nehru Bal Chikitsalaya, Delhi. I scored Rank-4 in NEET-SS Pediatrics. What do you think is the correct approach to study for NEET SS? Only MCQs or Theory+ MCQs ? Ideally it requires 5 to 6 months. Nelson's Textbook of Pediatrics and Cloherty Manual of Neonatology. Yes, I have previously attempted DNB SS and scored 120 rank. This time I did both theory as well as MCQ's. Revision is must and daily practice of MCQs is very important. I studied for 10- 12 hours in last 3 months and before exam for one and half month, I devoted around 15- 16 hrs per day. Yes, I planned my course according to time and finished 2 times revision in last 1 and half month. Yes, I did MCQs on PrepLadder app and it helped me a lot to keep my preparation on track. I liked the way how PrepLadder presented the course in units and then grand tests which were very much helpful. I got rank 1st rank in Post Diploma DNB Entrance Exam. Cardiology is always tough to me and gastroenterology was easiest to read from Nelson. Read and revise Nelson as much as you can. It's very important. We thank Dr. Rohit Anand for sharing his success story.